When dry pantry goods lined up in labeled containers is your kink. 1. An expandable cabinet shelf for doubling the space to house all your coffee mugs because you can't tell yourself no in the Anthro sale section. Has sturdy iron construction, expands from 15.75 inches to 30 inches wide, and can hold plates, bowls, cups, and other fine china. Get it from Jet for $24.99 or Walmart for $29.99. 2. A mountable stemware rack that'll fit underneath your kitchen cabinets for safe keeping. Get it from Jet for $7.77 or a similar one from Walmart for $9.07. 3. A pack of Sugru (moldable glue you can use to make hooks, hang storage racks, and other handy cookspace tasks). Has eight individually wrapped packs of glue that sets overnight, so you don't have to use it all at once. Can be used indoors and out as it's waterproof, heat- and cold-resistant, durable, flexible, shock-resistant, and electrically insulating (up to 24 volts). It can hold up to 2 kilograms! Get an 8-pack variety of colors from Walmart for $21.95 or Jet for $22. 4. 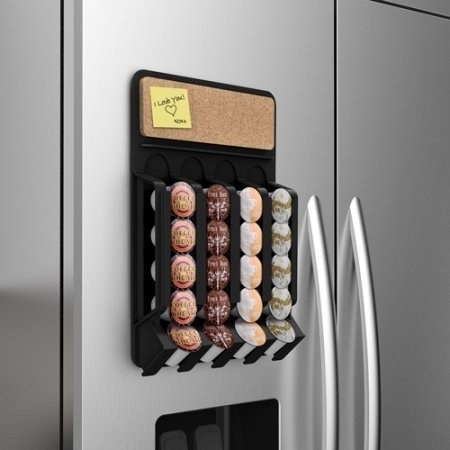 A pull-down spice rack any and all vertically challenged people will love because it might save them a hunt for the step stool. Measures 13.63"x4"x13" and hardware is included. Get it from Walmart for $16.27. 5. 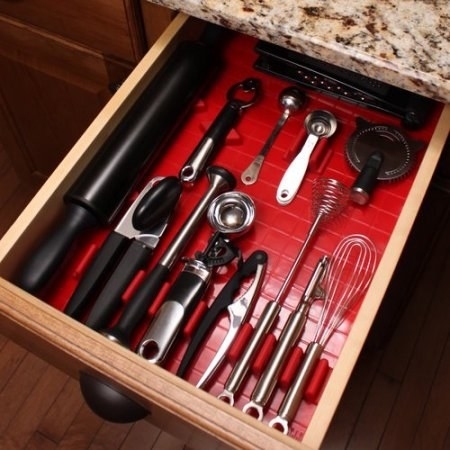 An adjustable drawer-organizing system to grow with you and your kitchen utensil arsenal. Made of dishwasher-safe silicone. Includes a nonslip basemat, and 15 reposition-able Divitz in three sizes. Basemat measures 20"x14" and can be easily cut to size. Get it from Walmart for $30.74+ (natural, red, and sky blue) or Jet for $34.99 (green only). 6. 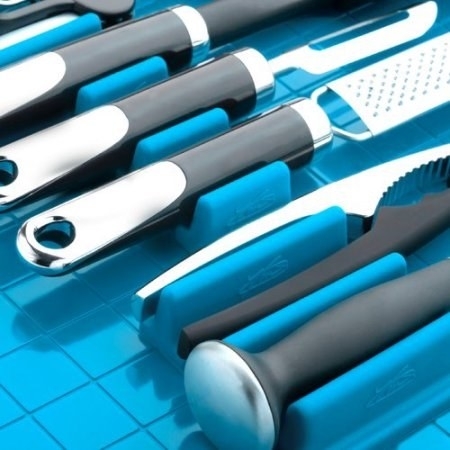 A pan and sheet organizer to transform the random cabinet that you can't figure out a use for while also protecting the non-stick coatings of your baking go-tos. Get it from Walmart for $13.77 or Jet for $14.49. 7. And a cutting board rack so you can better eye which board you're supposed to use for meat and which you're supposed to use for veggies. Get it from Walmart or Jet for $11.72. 8. A heavy-duty pan organizer that'll be able to *stack up* to your cast-iron collection. No assembly required. Measures 10.5"x12.4"x8"
Get it from Walmart for $51.19. And if you need more cast-iron to round that collection out, check out our picks for the best cast-iron skillet on BuzzFeed Reviews! 9. A stackable rack to finally bring some order to the pile of cleaning products or loose fruit or really most anything that could use some coralling. Get it from Walmart or Jet for $26.98. 10. A wall-mount knife rack with a strong magnet to keep your cutlery right where you need it. Measures 13" long with a powerful magnet. Get it from Walmart for $5.99 or get a 12" wooden one from Jet for $22.37. 11. 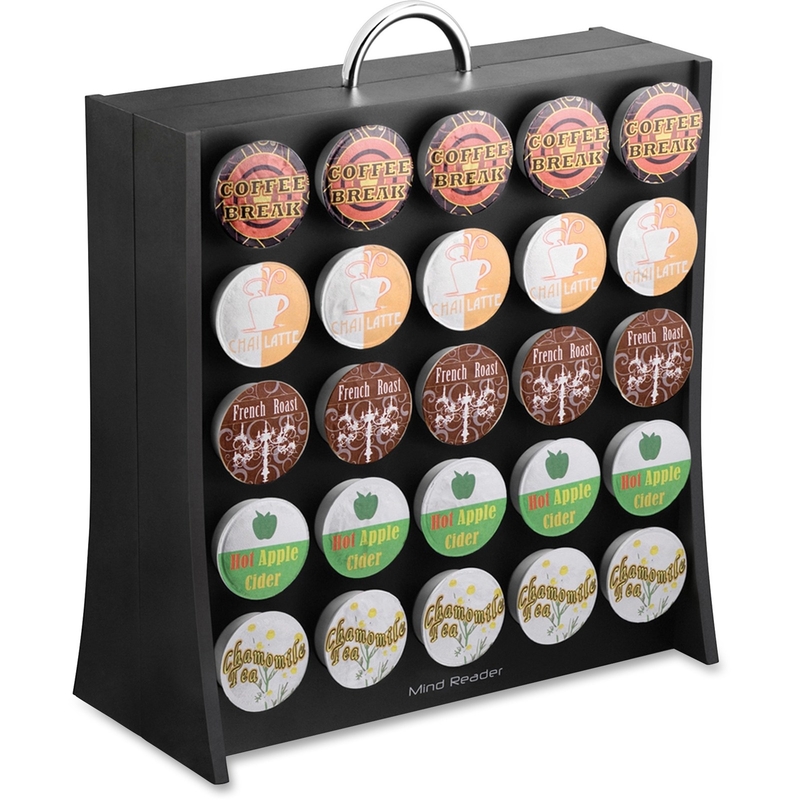 A 50-cup coffee pod holder or wall-mount organizer so you can finally banish the boxes of future coffee to the recycling where they belong. 12. A tea bag holder with nine removable drawers for when you need to spill the tea without hogging a whole cabinet. Get it from Walmart for $14.14 or Jet for $14.99. 13. A lids catchall rack to group pot *and* food storage container lids together. Get it from Walmart for $16.65. 14. Or a horizontal lid organizer in case you're a lucky duck with a shelf to spare. But really, do you live in Versailles or something? Measures 13.19"x5.51"x3.54"
Get it from Walmart for $6.44. 15. A five-piece China dinnerware storage set for when you don't need to pull out your wedding gifts, aka 363 days of the year. Includes a 7" saucer plate case, 8.5" dessert plate case, 10" salad plate case, 12" dinner plate case, and cup chest with chipboard divider. Stores complete services, up to 12 place settings. Get them from Walmart for $16.07. 16. An adjustable under-sink shelving system so you don't have to Tetris shelving units together. Get it from Walmart for $16.06 or a similar one from Jet for $11.99. 17. A peg organizer system for keeping contents from rattling around while you're searching for that one pot lid. Wood construction with a clear finish. The smallest size includes one drawer insert and nine pegs. Can be trimmed to an exact size with a table saw. Get it from Jet for $52.03+ (three sizes). 18. A sturdy can dispenser to see how many LaCroix cans you have left instead of reaching your hand into a dark cardboard box like a horror movie villain searching for your next victim. Get it from Jet for $10.81 or a similar one from Walmart for $14.69. 19. A four-can rack with a helpful handle to move large quantities of soda ASAP, aka what I do for my second job. Get it from Walmart for $6.24. 20. A ~labeled~ utensils crock that'll tell everyone exactly where the wooden spoons, fish spatula, and whisk live. Get it from Walmart for $11.62. 21. A packets organizer to encourage your family to use those Pedialyte and Crystal Light drink packets before they fall into the back of your pantry for three years and expire. Get it from Walmart or Jet for $11.41. Holds up to 38 lids (26 small and 12 large), made of BPA-free plastic, hand-wash only, measures 11x7.75x3.75 inches. Get it from Jet for $15.32. 23. A sink caddy that'll be a drip-dry saver for the babes fortunate enough to have a double sink. Jealous. Get it from Jet for $9.13 or Walmart for $9.19. 24. A pair of under-shelf wire baskets in case there never seems to be enough space on your pantry shelves. Get them from Walmart or Jet for $15.99. 25. A two-tier shelf for conjuring up a perfectly sized skillet for dinner without a flashlight. Includes mounting hardware. Measures 11-3/4"x22"x18"
Get it from Walmart for $109.50. 26. A 10-piece set of food storage containers with airtight locking lids (and chalkboard labels) to rid yourself of half-used boxes of pantry staples while creating a beautiful custom lineup. Get a 10-piece storage set from Jet for $68.97 or 15-piece set from Walmart for $95.95, and 56 waterproof chalkboard labels from Walmart for $6.99. 27. A double pantry can organizer so you don't have to figure out which soup can's rings will cozily fit into the lid of another. Get it from Walmart for $13.38. 28. A wrap organizer to tidy up that corner of your lower cabinet where you throw boxes of aluminum foil. Get it from Walmart or Jet for $8.95.